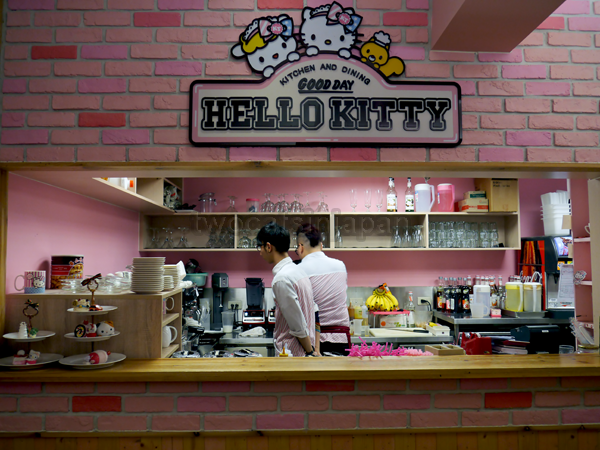 Taipei, or Taiwan in general, turns out to be a rather fertile ground for theme restaurants. Something in the island water, perhaps? 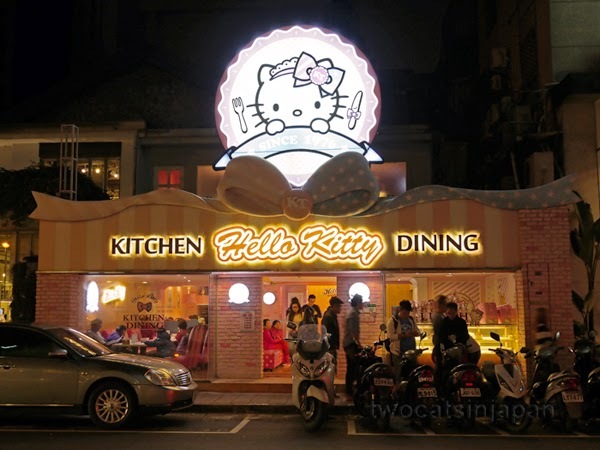 Yeah, there are theme restaurants in Japan and Korea, too. But Taiwan brings this game to a whole new level. 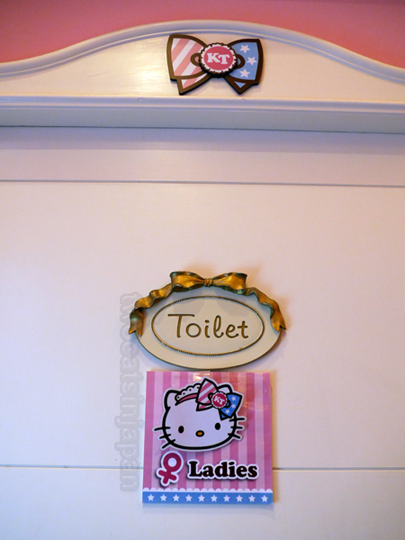 I mean, what else can you expect from a country that has not one, but a whole chain of toilet themed eateries? And yeah, we went there too. Duh, of course! 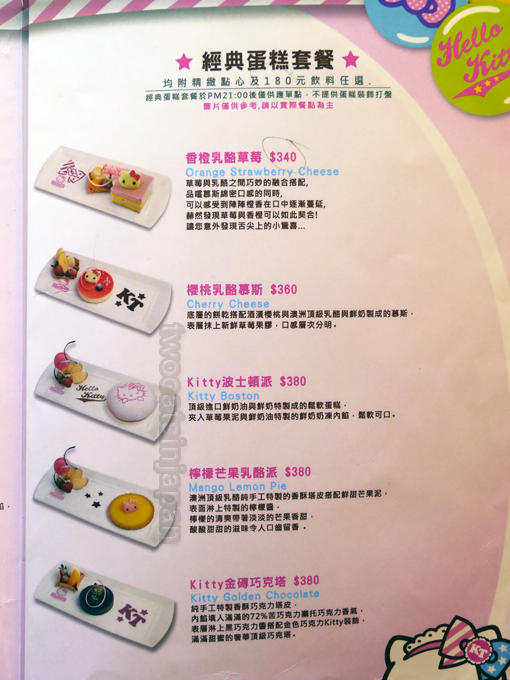 That was the sole reason why I wanted to visit Taiwan in the first place. 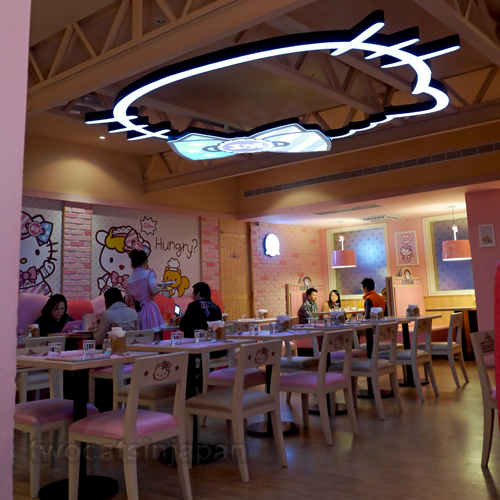 And since I was already there, I simply couldn't miss a chance to eat at this other mystical, mythical place... A Hello Kitty themed restaurant. 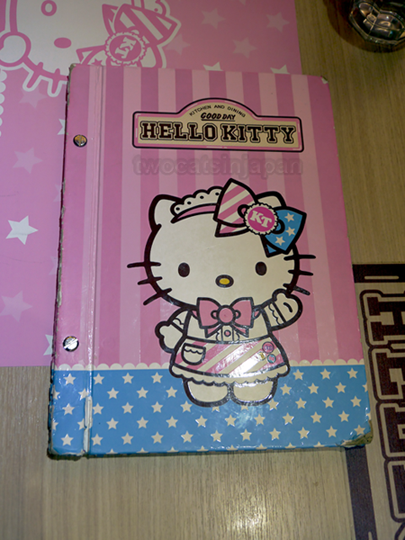 Yes, I'm a 43 year old woman and I'm not ashamed to admit that I love Hello Kitty. 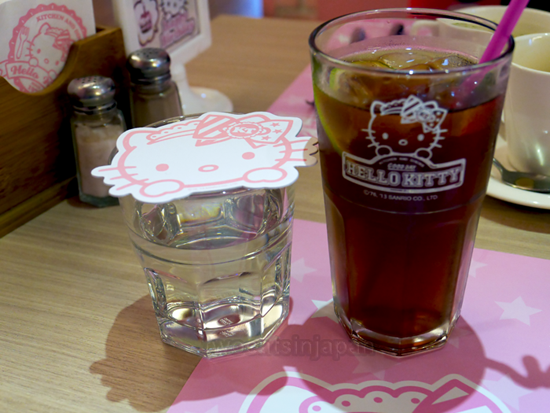 (I also love My Melody, Rilakkuma, Totoro and Kumamon. I do draw the line, however, at Jewel Pet and Yokai Watch). 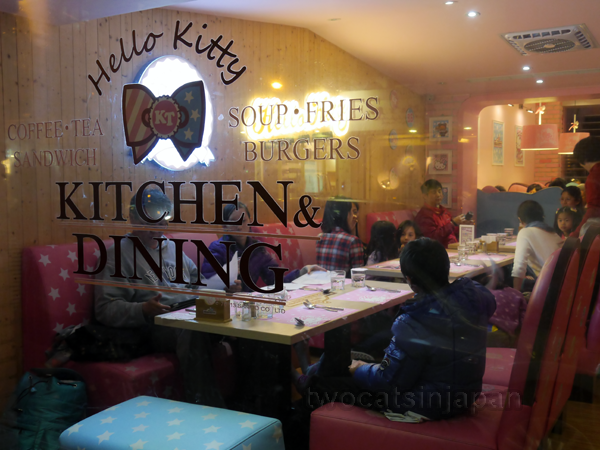 The tourist office folks advised us that if we wanted to eat at Hello Kitty Kitchen and Dining, we should definitely make a reservation. The phone was busy. And busy. And then busy some more. When I finally did get through, the woman who picked up spoke enough English (or rather, Engrish) to understand that I wanted a reservation for 5PM. She then proceeded to ask me something apparently very important, because she kept repeating it over and over, with increasing levels of frustration. Yet as she was doing it in Chinese, her efforts were all but lost on me. Later, at the restaurant, I realized that she most likely wanted to know if we preferred downstairs or upstairs seating. Getting to the restaurant was easy. We took the subway to Zhongxiao Fuxing station and then walked through a long underground shopping passage looking for exit number 13. If a person with my sense of direction, or rather, lack thereof, could find the restaurant, it should be pretty easy and straightforward for normal folks, too. The place was busy. The downstairs section filled up the minute we arrived. By 6PM, there was a line outside. I have read many reviews claiming that the waitresses are rude and impatient with the guests. That has NOT been my experience. If anything, they were very accommodating and pretty indifferent to my attempts to photograph every square inch of the restaurant. The place has a minimum order per person policy, but I don't remember what it was. And since the prices are rather high to begin with, it's easy to go above and beyond this requirement. 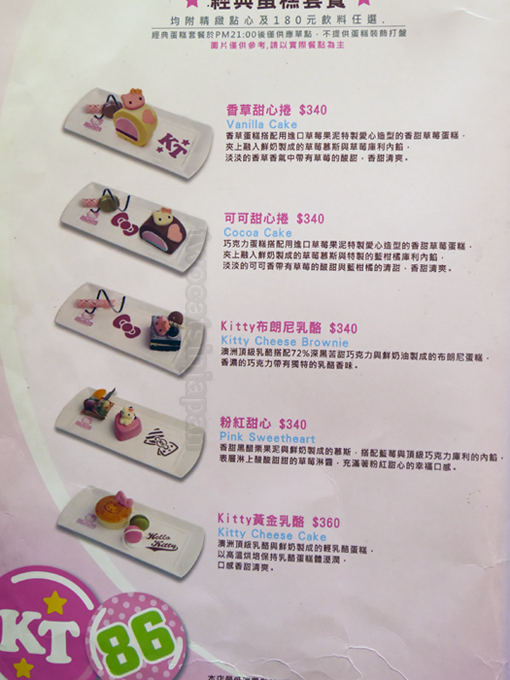 Because, let me tell you, everything on that menu is bloody cute. And you'd want it all. 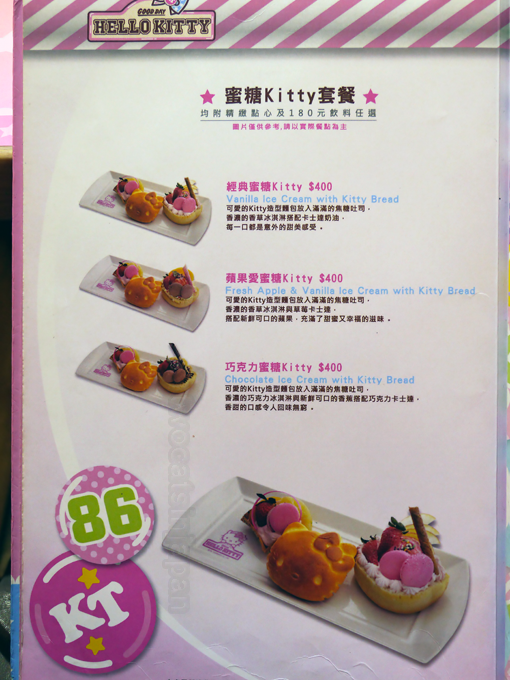 The food itself is hmmm... how to put it nicely... edible. The fact that you don't go there for the food should be obvious to any sentient being (but apparently not to some online reviewers who expected, I don't know what? Michelin stars, or something?). We ordered burgers and dessert, and the portions were big enough that I wasn't able to finish everything in one sitting. And if you know how much I can eat, you can easily imagine that this was a load of food. 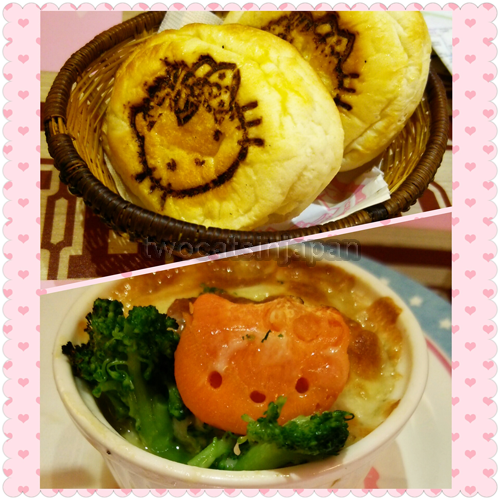 Cute looking food. 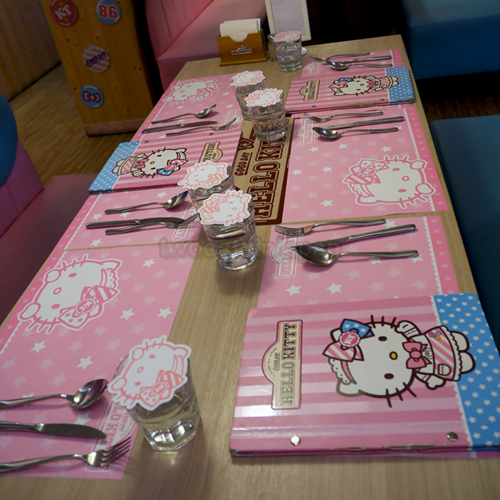 The decor is what one would expect from a Hello Kitty themed place. Paradise! 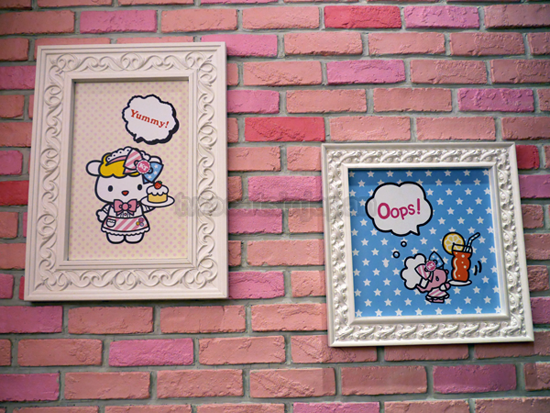 Pink heaven of cuteness and sugary overload. Even in the toilet. 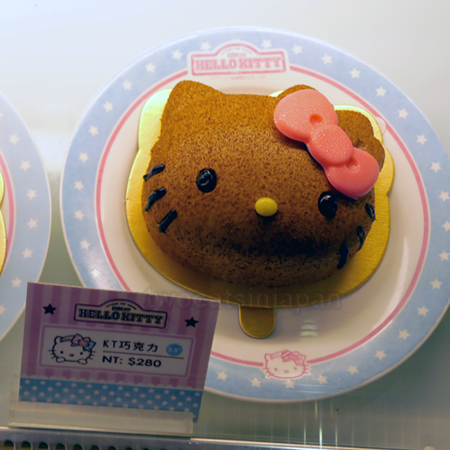 You can't help it but feel like a Sanrio character yourself. 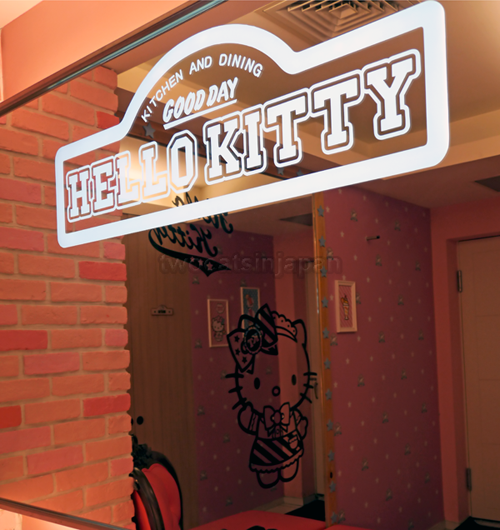 You can't help it but smile and be cheerful and kind to your fellow human beings, because you're in Hello Kitty land. Unless you're a man. Then you sit there with a pained expression on your face and count the minutes until you can leave. We also had salad, soup and desert, but for some reason I didn't take photos of most of it. That alone should tell you how excited I was. LOL! The guests were not just adolescent females, as you might expect, but a varied crowd you might see at any other restaurant - young and old, male and female, families and couples, with kids and without. There was even an all male group waiting to be seated as we were leaving. I love this place. 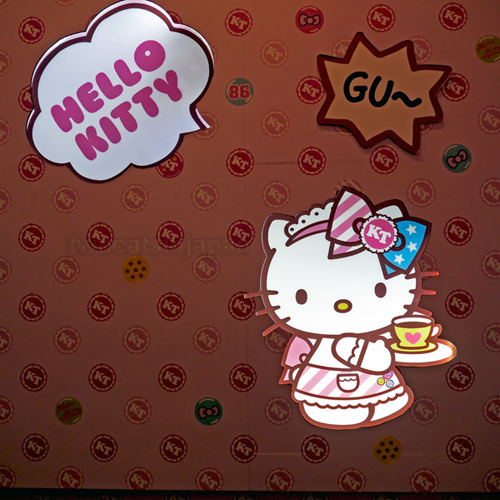 But then again, I'm a grown woman who not so long ago owned a Hello Kitty comforter, a Hello Kitty toaster, who still owns Hello Kitty cups and t-shirts and socks and pens and watches (yes, plural - watches) and over 50 Hello Kitty cell phone straps. 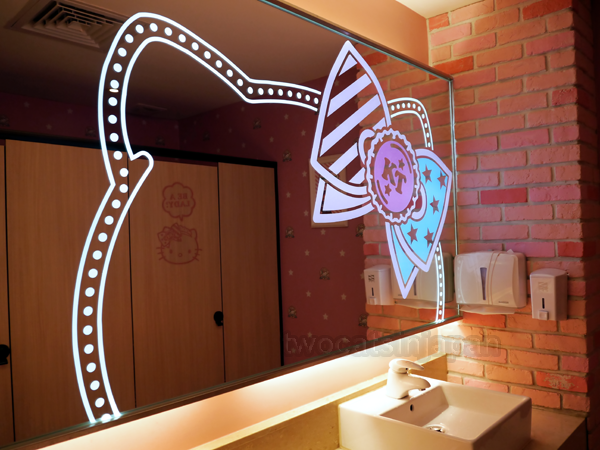 And like a total perv, I was also taking photos in the toilet. 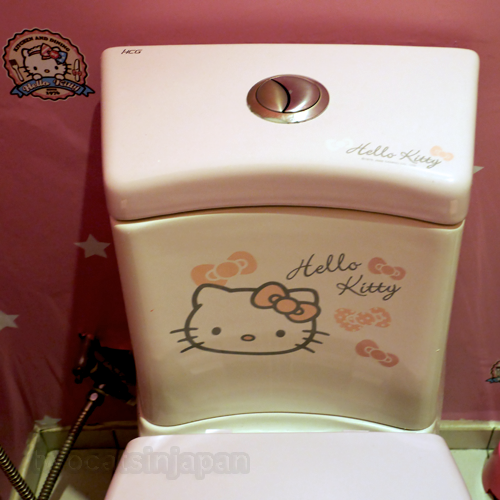 Because if I had my way, every toilet would look like a Kitty palace. 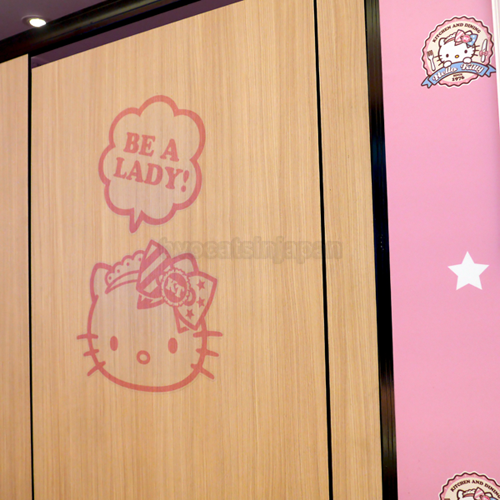 So we could always remember to "be a lady". Told you I was acting like a total pervert. 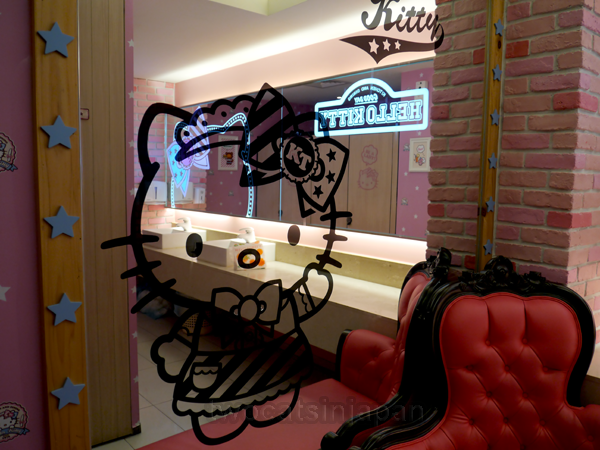 I had enough self restraint not to go and investigate the boys' room. 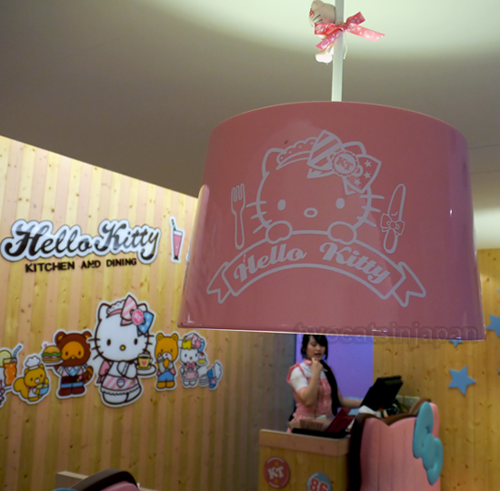 If I go to Taiwan again, will I make a repeat visit to Hello Kitty Kitchen and Dining? You betcha! 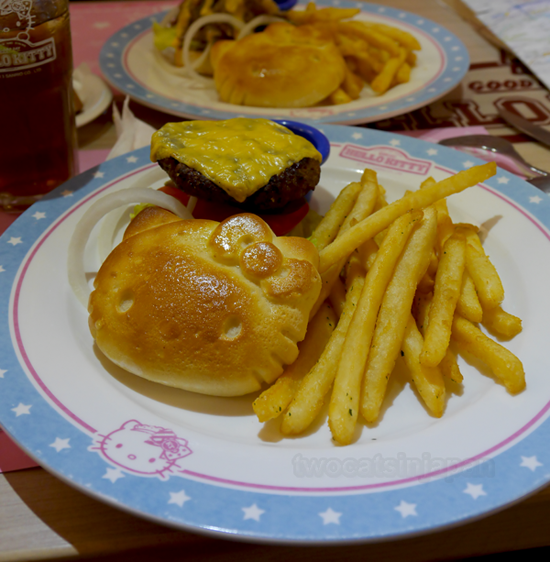 Despite the high prices and pretty looking but mediocre food, this place made me forget the troubles of daily life and be a kid again. Even if only for an hour. And if you have no time to sit down and have a meal, no worries, there's always takeout. 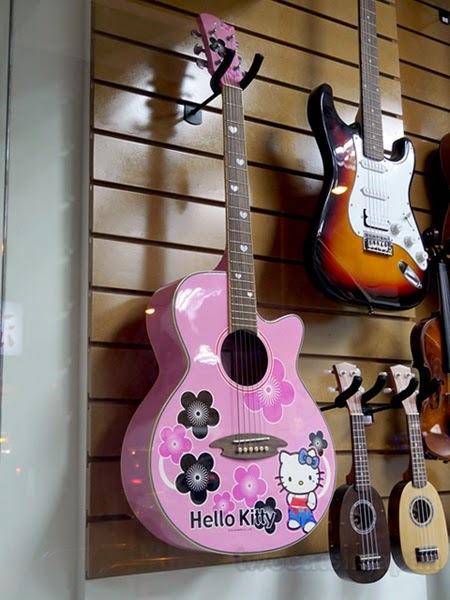 And on the way back to the place where we were staying, we passed a music store.